I left Cape Town last Wednesday (1st July) with the intention of reaching Vanrhynsdorp and staying there overnight. By the time I had hitched up the caravan, checked all the lights and left Noordhoek it was just after 9am so decided to pop in at my daughters house in Claremont and borrow some videos to watch while I am away. Collected the videos, said my goodbyes for the next 2 months and was on my way. The trip was uneventful, apart from the fact that I was travelling over roads that I had not been on for over 40 years so it was like a trip down memory lane, and I made good time – past Malmesbury, Moorreesburg, Picketberg, Citrusdal and Clanwilliam. I decided to stop for petrol and stretch my legs at a place called Klawer about 320ks from Cape Town. I had been driving smack into a fairly strong head wind most of the way so the petrol consumption was horrendous. It was still pretty early and Vanrhynsborp was not to far away so I thought that I might as well push through to Springbok and stay there overnight. The head wind was even stronger and I could actually see the petrol gauge going down minute by minute as I drove. Also it felt as if I was driving on inclines most of the time and I knew the petrol consumption was going to be even worse when I next filled up. It was!! Before I left Cape Town I had had a chat to a guy who runs a 4×4 shop in Noordhoek and got some pointers and advice from him as he was brought up in the area, Port Nolloth and Alexander Bay, as to where to go and where to stay. I also got a mobile deep-freeze from him so I could take quite a lot of frozen food with me. The first bit of advice was to stay at the caravan park situated just before you turn into Springbok. Unfortunately there are 2 turn off’s into Springbok and I should have taken the 2nd. 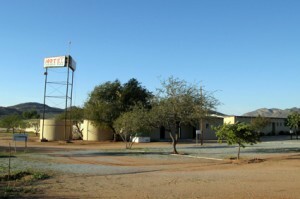 Ended up at the Kokerboom Motel & Caravan Park. 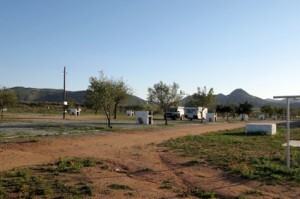 Only found the park I should have gone to, The Springbok Caravan Park, the next morning – also not great but a bit better and at least some other people staying there. Pat, I dig how you now call Chris and I by our Twitter names 🙂 Congratulations on the launch of your new site. It was a pleasure helping create it for you. Thanks to you, ChristopherM and BiggestMullet for setting everything up. Miss and love you to.